The latest PKK [arms] store was discovered outside the southeastern city of Şiirt, in Eruh province [in Turkey]. During a routine patrol of the area [by Turkish security forces], 40 kilos of ammonium nitrate were found. In Hatay, meanwhile, 1.5 kilos of plastic explosive material was captured, along with 12 kilos of TNT. In Mardin, 300 grams of the explosive A4 and 800 grams of ammonium nitrate were captured. In Şırnak, four kilos of A4 explosive and five mortar rounds were seized. 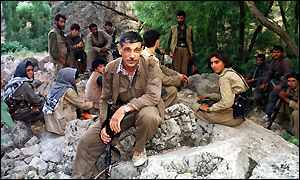 So where does the PKK get its weapons? Check out my post at War Is Boring to find out.